I was at Origins in Columbus last week. Germania is with an interested publisher (we played a game at the convention). The next step, by his reckoning, is written negotiations. It is still the case that any comments about the clarity of the rules are welcome. The publisher also may want to change some of the names (Granada to Lusitania, for example), and in a game like this that is always a matter of taste, whether you use Roman, Dark Age, or later Middle Ages names. I have revised the rules for clarity (not in substance) since I sent them to several of you. I talked at length with another publisher about Seas of Gold, which is not quite ready for "blind" playtesting. Nothing going with Gangsters: the small company I'd talked to last year wasn't at the con (not unusual), and I haven't got a peep out of Steve Jackson games. This business is always very slow. Publishers plan issues well ahead--FFG is already booked up through 2006, for example. The main Fantasy Flight guys were not at Origins. I understand they're about to deal in earnest with Brit 2, which makes the publication date sometime in the late fall. They also have Dragon Rage, a game originally published in 1982, but have not had time to look at it (and I don't know when they will--they're very busy, and hiring new people). Here are some figures that may interest you about the business side of boardgaming. Print runs are, usually, much less than in days of old. The print run of Britannia in UK was 10,000 in 1986, and I suspect (don't know) twice that in the US, maybe more. Dragon Rage's original print run in 1982 was 10,000. If Brit 2 sees 5,000 this year, that will be exceptionally high for a wargame. Wacht Am Rein, a successful "big" hex wargame, had a print run of 1,500 (and will be reprinted). I've read (don't know) that Columbia does 2,000 of each of their popular "block games". Strategy & Tactics magazine's circulation (with the game) is about 3,200; Against the Odds magazine is 2,500. S&T also does some 7,000 without the game through Barnes and Noble. In other words, there's not much market for any individual wargame. I suspect that's because there are so many games that the market is diluted, but also because younger people have found other things to do than play board wargames. Euro-style games can have quite small print runs to start with (but larger than wargames), and are perhaps more likely to be reprinted. One that wins the German Game of the Year award can go to half a MILLION in reprint, however. Even among collectible card games, there's great dilution. One game collector has more than five hundred CCG in his collection. One of the main halls was devoted to CCG, with the national Yu-Gi-Oh tournament handing out significant prizes (expenses-paid trip to world championship in Tokyo and a DVD-equipped laptop for first and second place; the trip for third and fourth place). The "cult of the new" was very obvious at Origins. Manufacturers of collectible card and related games (there's one that uses a poker chip format!, as well as all the miniatures versions) employ people to teach convention attendees how to play the latest games in hopes of hooking them "on the spot". The boardgame tournaments are much smaller than at WBC (where the focus is on playing great games), even though the overall attendance is 15 times higher. BTW, Origins attendance was 11,000 unique individuals after two days, so they expected to go over their record of 15,000. WBC attendance is about a thousand. GenCon claims 50,000, but that's person-days, not unique individuals, so it would appear to be the same size as Origins. It's been said that Euro games are very pacific because Germans don't like wargames. I'm told, however, that computer wargames sell very well in Germany. So the consumers don't mind wargames. It's the owners of the shops (family game shops) who feel they shouldn't have conflict games on the shelves. I used to correspond with Roberto di Meglio (owner of Nexus, co-designer of War of the Rings). But in January he went silent on me, even though we were working on a business proposition. I got so concerned that I finally asked someone who worked with Nexus how Roberto was doing, and was told he's fine. But I still cannot get a word out of him. Very puzzling. Brit 2 (again), Seas of Gold (tm), and Enchanted Labyrinth: The Card Game (tm) have most occupied my gaming time lately. Along with Stars of Gold (tm), which leaped into being recently. It is somewhat like Seas of Gold(tm), not surprisingly, and similar in that after I played it three times I have a full set of playable rules, most unusual for me, but about the same thing that happened with Seas. 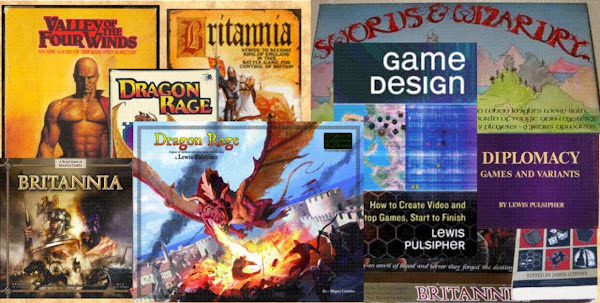 I have been thinking about writing a book about game design. I realized that some of the articles I have written, or that I'm writing now, are excellent material for such a book, and when I checked word counts I found that a reasonably-sized book isn't all that time-consuming (80-90K words is a shortish novel). Now who would publish such a thing is another matter. I would aim for it to be the same size as Game Inventors Guidebook (I may have the title twisted) by Brian Tinsman. I'm working on an outline. I'll be at Origins and WBC, but none of the other big conventions. More local game meetings are better places for playtesters.